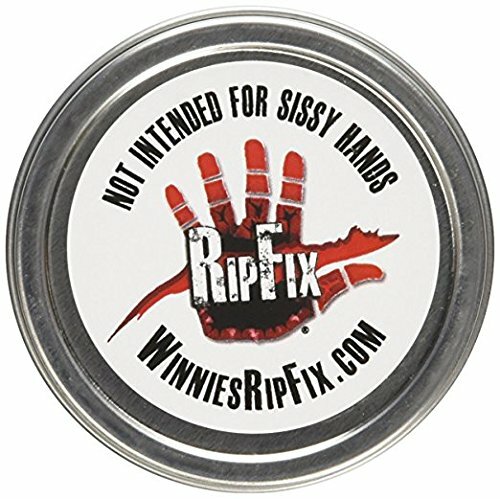 Winnie's RipFix is the ideal product for hands damaged from working out. It helps maintain good calluses, aids against tearing, takes the sting out of rips and speeds up recovery. Nearly every gym and fitness enthusiast has had calluses and torn skin. Calluses forming on your hands or feet is an inevitable part of training. Unfortunately, calluses can sometimes tear causing terrible pain. Calluses generally are nothing more than thicker areas of skin. They form from the repetitive friction and pressure on the skin. A callus typically appears on the hands from lifting or feet from cardio. But if your hands and feet aren't cared for correctly, then calluses can become a nuisance, and worst, rip right off. A callus tear takes time to heal and throws your training schedule completely off. If you get hand rips from exercise, then Winnie's RipFix is the remedy for you. RipFix is the only product on the market that is made by a family of athletes specifically for hand tears. RipFix will take the sting out of a rip / tear instantly. For the wound to fully heal, you will want to apply the balm / cream to the affected area soon after the rip occurs. For best results, you will also want additional application every night before bed until healed. Although RipFix works amazingly for handcare, it is also great for dry cracked heels, bar rips, blistering, cuticles, rashes, eczema healing, chapped lips, cuts, rough skin, blemishes, scabs, minor burns, chafing, tattoo aftercare and even hot spots remover on dogs. RipFix is a great solution to gymnasts / gymnastics, weight lifters, rock climbing / climbers, runners, fishermen, drummers, ball players, gardeners, construction workers and even roller derby chicks. If you are tough on your hands (or feet) this is the remedy for you! We feel your pain and know how to fix it! RipFix contains a proprietary blend of camphor, beeswax, coconut oil, tea tree oil, honey, and petroleum jelly. Absolutely no parabens! BUY MULTI-PACK TO SAVE - Prevent and treat rough, dry and ripped hands. Complete handcare system in one easy to carry tin. Solid salve / balm protects sensitive skin on palm and heals rips that occur. Commonly used by gymnasts, lifters and rock climbers, but also any other activity that causes hand injuries. Handcream lotion hydrates cracked, dry hands. Can be used along with RipFix pumice stone to smooth calluses. ABSOLUTELY NO PARABENS - RipFix contains a proprietary blend of camphor, beeswax, coconut oil, tea tree oil, honey, and petroleum jelly to hydrate your skin much more than lotions with a water base. Skincare products like Callus scrapers and shavers are tough to use and can actually make the injury worse if used incorrectly. RipFix is very easy to use at anytime for hydration. HEAL HANDS WHILE YOU SLEEP - Ript and torn hands can be very painful. Tears and rips can also prevent you from having a solid workout. RipFix will heal your wounds faster and get you back in the gym a lot quicker. Best part is, applying RipFix at night before bed will help your skin heal while you sleep! RipFix is essential to every athletes equipment / athletic bag. WHO IS RIPFIX FOR? - RipFix is great for dry cracked heels, bar rips, blistering, cuticles, rashes, eczema healing, chapped lips, cuts, rough skin, blemishes, scabs, minor burns, chafing and tattoo aftercare. RipFix is a great solution to gymnasts / gymnastics, weight lifters / weightlifting, boxing, rock climbing / climbers, runners, fishermen, drummers, ball players, gardeners and even construction workers. If you are tough on your hands (or calloused feet) this is the remedy for you! WHY CHOOSE RIPFIX? - RipFix is the only product on the market that is made by a family of athletes specifically for hand tears. We feel your pain and know how to fix it! If you have any questions about this product by RipFix, contact us by completing and submitting the form below. If you are looking for a specif part number, please include it with your message.